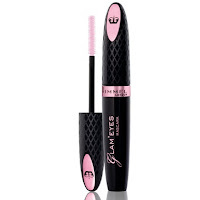 Rimmel London Glam'Eyes Mascara - Hairlicious Inc. Promises: Seductive Volume. Turn heads. New VolumFlex Brush styles lashes for sensational volume and instant separation. Ultra supple elasto-bristles groom each lash, lacquering them from root to tip for a spectacular 7 x more lash intensity. Big Lash Seduction. High Definition. Maximum lash impact. Impeccable definition. Smoothing formula glides through lashes, wrapping each one for ultimate volume yet perfect separation. Lashes look dramatically amplified yet sleekly defined - even up close and personal. The Truth: Overall, this mascara worked really well. The packaging was great. The applicator is placed outside of the mascara bottle which is good, it comes fresh & clean. I like how the applicator is not a brush, it's more like a comb so it keeps the cumps to a minimum on your lashes. There is a mixture of long separate bristles and short thicker bristles. The long bristles are designed to separate and lengthen the lashes while the shorter bristles help to give volume. As you twirl the comb through your laskes they become a lot longer and appear much fuller. The bristles are very far apart if you look closely in the pic. I love the pink & black theme, very chic! The only thing I don't like is the fact that the comb is slightly bent and very wiggley. I like it when they are straight across, its just easier for me. your lashes are gorgeous! I bought this mascara and dried up on me after a week...oh well! @ EI- Thanks! No clumps = 2 thumbs up! @ Dyvalicious - Yeah clumps are hard to avoid. It could also be your technique. @ Classieme - Really? LOL thanks! I try to make sure the pics are as clear as possible to give you guys a better view. @ Jamie - Thanks Jamie. Dried up? Wow...Sorry to hear that. I should have got it!